My daughter loves to eat cookies. Well, to be honest, her mother loves them too. We didn’t have a tradition to bake them ourselves, but I decided to change that. That is why I collected the list of awesome healthy cookie recipes your kids will love. We are going to bake them all! Yum! The jam is made from fresh strawberries and Kelly got a little creative with the cookie recipe. She combined cashews with coconut flour, and it gives them a buttery flavor (without using any dairy). Stacey made this cookie dough from white beans. White beans are good at boosting energy and calming the mind. They can help improve your memory and can lower your cholesterol. They are also a great source of protein. Would you ever think of putting chickpeas in cookies? Nope, neither would Vicki until she started investigating healthy cookies and how to make them so they are still delicious cookies. And she made it! These cookies are an excellent balance of salty and sweet, soft and chewy. They are hard to stop eating, so be careful! One of the most versatile cookies around, chocolate chips can easily be changed up depending on what you have on hand. The key is to start with a good base recipe and to use quality ingredients. Plan to make this dough at least a day ahead. It needs to chill to firm up, to allow the butter and cream cheese to enrobe the flour, and to give yourself a break from kitchen marathons. Krista says that this is the BEST pistachio cookie recipe EVER. We will trust her and bake these asap! They are totally vegan, gluten-free, and allergy-friendly of course and full of clean real ingredients: quinoa flakes, pumpkin, unsweetened cocoa powder, and of course cinnamon. Baking helps Vinma to relax and lift up her spirits like no other. Well, when she offers us such a great healthy cookie recipe, we wish that she relaxes all the time! These cookies are quick and easy, plus they’re pretty healthy, especially if you leave out or substitute the chocolate chips. *And just for full disclosure, there are affiliate links in this post about healthy cookie recipes. That means that I’m sharing something that I think is helpful, and if you make a purchase through the link, I earn a little bit back. No extra cost to you, and just a little help for me to pay for the blog expenses. I’m heading over to check out those strawberry jam cookies right now. They sound delicious and I love that they are paleo-friendly! Wow, this is such a great roundup of cookies. I never thought of adding white beans to cookies…they would be protein packed for sure! Thanks so much for including my cookies in your post! These recipes look awesome; I can’t wait to try them! Thanks for sharing these. I will definitely try them. They all look so yummy. Yummy! Thanks for including my 3 ingredient cookies! awesome roundup! Those healthy cookies look delish! Wow! I never thought of white bean for cookie dough!! Definitely going to check that out. Thanks for sharing! Nice! Definitely going to try some of these! Hi! 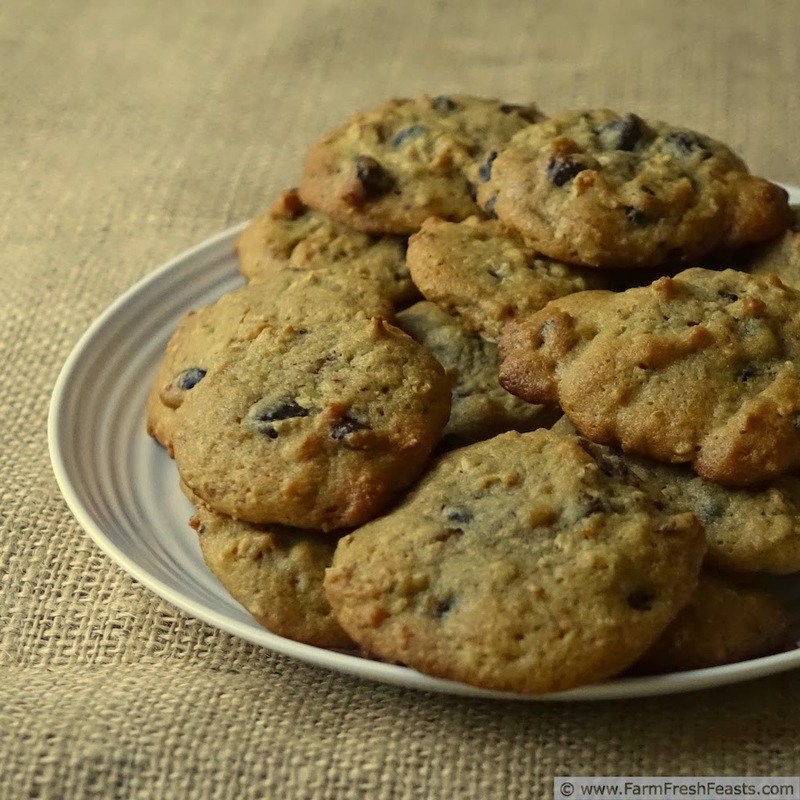 Thanks for including my Oatmeal Chocolate Chip Cookies with Chickpeas! My kids ask for them all the time! I will be trying many of these other recipes here too! Must make cookies NOW! Thanks for sharing these! Yum, yum, yummy! I am such a sucker for cookies, I can never stop at just one! My daughter would be going for those chocolate dipped ones…anything remotely chocolate she is all over in a heart beat! Awesome round up–thanks for including me! I’ve never put healthy and cookies in the same sentence before but my kids are huge cookie junkies so will be checking these out. Wow. Those chocolate-chip dipped cookie dough cookies look amazing! I am so going to writing these down so I can bake them for myself! LOL! My little one is only 7.5 months so mama will surely have more to myself! Thanks for all the ideas! those strawberry jam cookies look so yummy! i want some of those now. lol it’s good these cookies pass the kids test. I love cookies big time unfortunately never really have the time to bake them, thanks for this round up I will bookmark for future use once I am settled. I love the idea of healthy-ing up the cookies. I’ve heard of carrots in there, but not really chick peas. I’d do it though, definitely. This looks fantastic! I love anything healthy and something the kids would eat as well is a double win win for me! Thanks for sharing your recipes 🙂 I will def. try them out soon! Wow this is a great round up! We love cookies and I know my kiddos would probably like every one of these! You definitely have great collection of healthy cookie recipes here. Thanks for sharing them, I will try the pistachio cookies. Oh my goodness, I am personally pinning this for sure. What a great collection! Thanks for linking up at MeetUp Monday – Hope to see you there again this week! since we love peanut butter at my house and cranberries are from heaven, we will be trying all recipes with those ingredients. Thanks! My little guy and I love oatmeal cookies. I’ve been wondering what I can do with these chickpeas I bought. Now, I have a great use for them! I love chickpeas – if you don’t know what to prepare with them, let me know, I have an amazing chipkpeas burger recipe!! All your cookies look delicious! I think it’s a great tradition! It’s good to start traditions of our own. hahah, I know what you mean.. my daughter loves them a lot, but mostly I eat them all 😀 Damn those tasty cookies! My daughter would love these recipes, she loves making cookies and sharing them with family and friends. These are some awesome cookies for kids indeed. The pistachio cookies and the chewy peanut butter cookies look amazing and I will be making them with my niece’s kids for sure. Thanks so much for sharing. I can never resist cookie recipes, particularly because my daughter loves them. But healthy cookie recipes…oh my! That’s A++++ in my book! Thanks for sharing! That first one sounds so interesting! I’d love to try it! Thank you for sharing these! My daughter keeps asking for cookies and I’ll feel pretty good about giving her a few of these. Same here. She wants to eat cookies all the time! With these at least I know what is in them, so I prefer them more than store bought! Oh my gosh so many great recipes! Pinning for sure! What a great list! I will definitely be trying some of these soon. Thanks for sharing! Well, now you’ve made me hungry. lol I’m going to have to try several of these recipes.